Do you have those things that your family wishes you’d make more often, but for whatever reason, you just don’t make more than once in a blue moon? Yeah. Me, too. 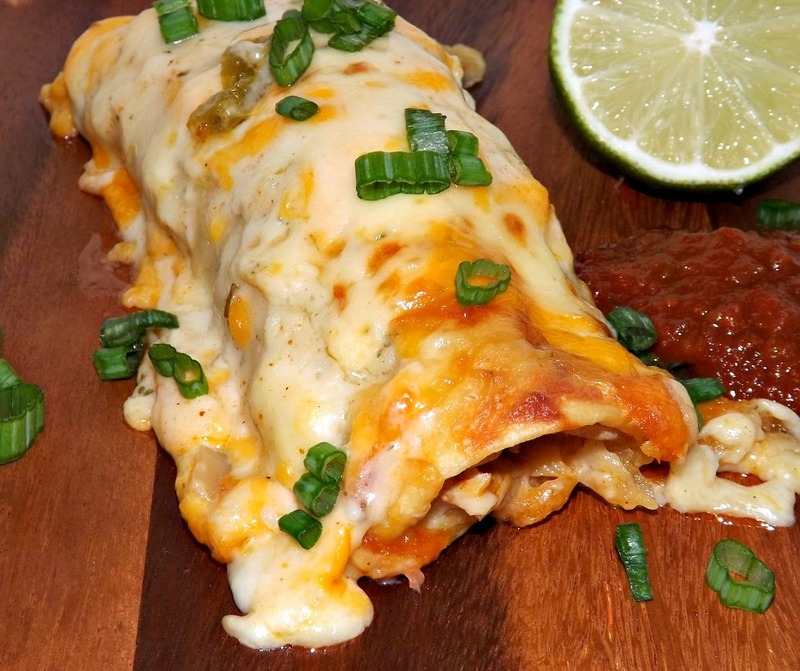 My family loves enchiladas, but for some odd reason, when I’m not actually in the process of making them, my mind tells me they are a chore to make. Mind you, they aren’t a quick 30 minute meal; not if you’re doing them correctly, but neither are they as tedious as my lazy, I’d much prefer to sit in my recliner, read and eat Cheetos mind tells me they are. These are probably the best enchiladas I’ve ever made. The filling is mildly spicy, but not so much that wimps, I mean, the spice averse, in your life can’t handle them. They have a nice amount of cheese in the filling, but I was a good girl and didn’t do my usual overkill with the cheese, which is a bad habit I admit to having. Then on top, it’s smothered in a creamy, cheesy sauce. Say “yum” with me, class. And yes, there are a lot of ingredients, but nothing earth shattering or hard to work with. Remember, this will make two pans… I usually make one 13×9 and one 8 inch square pan with it, so feel free to halve it if it’s too much. Make your chicken first- combine the broth, onion halves, garlic and jalapeno in a medium pot with the chicken thighs. The broth should just about cover them if you push them down a little. Cover the pot and bring to a simmer over medium heat. Try not to let it boil, cause that toughens meat. let cook for about an hour, until nice and tender, but not falling apart. Let the meat cool in the broth until cool enough to handle, then take it out and cut into bite sized chunks. Strain the broth through a fine mesh strainer and discard solids. I then put the broth into a couple of jars and just put it up until the next day when I finish, but if you’re doing it all in one day, just pour 2 cups of broth into a measuring cup and set aside for now. While the chicken cools, cook your veggies and chorizo. In a large pan, cook the crumbled chorizo until it is browned. Scoop the meat out and put it into a large bowl, leaving the drippings behind. Add the chopped onion, chopped green pepper, garlic and jalapeno to the chorizo drippings. Cook over medium heat, stirring frequently, until the veggies are soft and lightly browned, about 7 minutes. Dump into the bowl with the chorizo. Add in the cubed chicken. let cool for about 20 minutes, then add in the green chilies and the Queso Quesadilla cheese. Stir well; add in the Mexican seasoning. Stir to combine and give it a taste to see if you think it needs more Mexican seasoning or a touch of salt. Now, you can either cover this and continue the next day or get the sauce made. If making now, preheat your oven to 350 degrees. For the sauce, put the 5 tablespoons flour into a medium pot. Slowly add in the half and half, stirring the whole time to prevent lumps. After all the half and half is incorporated, pour in the strained broth and stir well. Over medium heat, stirring constantly, heat the mixture until it thickens up, about 5 to 10 minutes. Remove form the heat, then stir in the Monterey jack cheese and the 1 1/2 teaspoons Mexican seasoning, stirring until the cheese is melted. taste for seasoning, adjust if needed (more Mexican seasoning, more salt) then put a lid on the pot (the condensation from the inner lid helps stop a skin from forming on a sauce) and set aside. Grease a 13×9 inch baking pan (I prefer glass) and an 8 inch square pan (not necessary if making a half batch). Wrap the tortillas in a damp paper towel and then warm them for 2 minutes in the microwave to make them more pliable. Take one corn tortilla and layer it on top of one flour tortilla. Scoop up (I just use my clean hands) a small handful of the meat/veggie mix and spread it down the middle of the layered tortillas. Roll the tortillas tightly and lay them, seam side down, in the prepared pan. Repeat until both pans are filled. Pour the sauce over the enchiladas (you’ll obviously use more on the bigger pan, so don’t try to divide evenly) and then sprinkle the cheese over the top. Bake in a 350 degree oven until bubbly and lightly browned on top, about 25 minutes. Serve hot with green onions and salsa for garnish and a squeeze of lime juice over the tops. 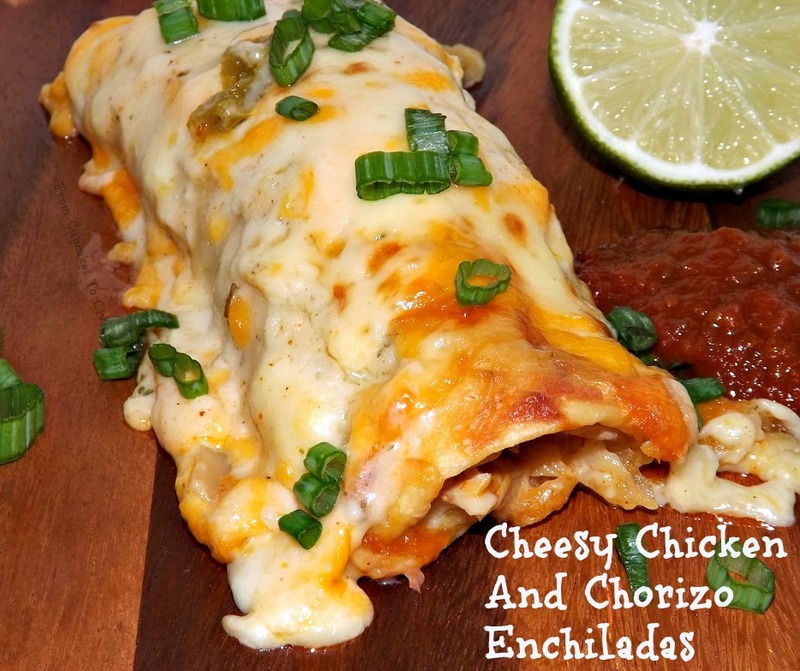 This entry was posted in Casserole, Cheese, Chicken, Sausage and tagged cheesy, chicken, Mexican, sausage by Janet. Bookmark the permalink.